I’ve been too busy nesting to blog. Sorry, I couldn’t help it. I used to think nesting was something people made up as an excuse to spend money at places like Target, T.J. Maxx, and World Market. Not that I blame people for that. I also thought it was a another way of saying “I am running out of time for the all the house projects I procrastinated but now that I’m having a freaking BABY a fire’s been lit under my a$$ and I need to get ORGANIZED. Like, yesterday!” Not that I blame people for that, either. 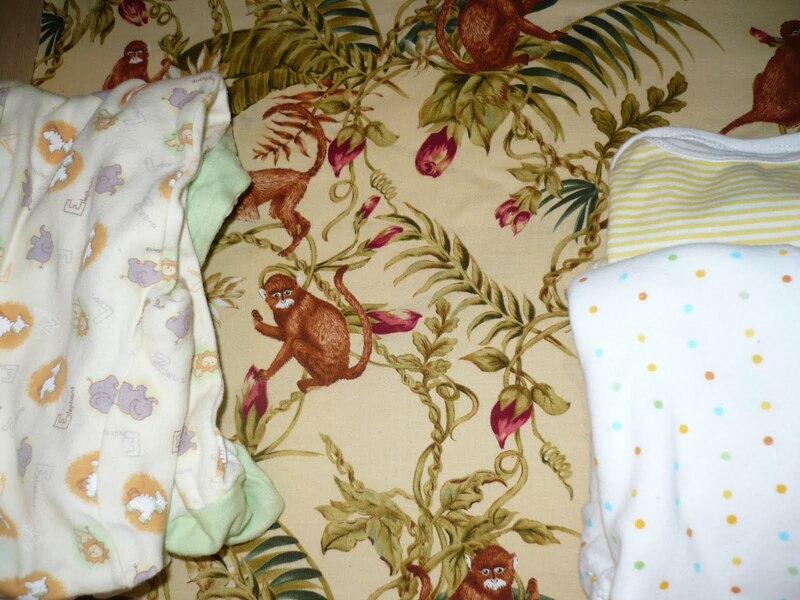 But now that I have been nesting with the enthusiasm of a monkey on crack, I am a believer that there is something physiological about nesting. I am especially pleased with my progress on the room formerly known as “the garage room”, heretofore referred to as “the den.” It used to be the garage, but someone who lived here before us remodelled so that we have a garage that would fit maybe a motorcycle, but it’s ok for skis, bikes, etc, and a room that I once dreamed would be our formal dining room, then fantasized about finally getting all the boxes and miscellaneous crap out of (which I must admit was no small feat), and when that was finally done, I imagined it as our den. If ever there was a time to turn it into a den for once and for all, now was the time. It was hard to move things around being all big and pregnant, but Dan was willing to help. And by “willing” I mean he was completely uninterested in this project and would never have made time to help me rearrange, except that I am carrying our child and out of concern for myself and the baby he moved the couch around so I could do what I wanted as far as wall art. So actually the pregnant thing really worked for me. I waited until he was out to get on the ladder to execute the final phase of the project, which I am going to share because its a FANTASTIC budget-friendly way to beautify any wall space, small or large! I wish I could include this in a post called “Awesome DIY decor for under $100” except it wasn’t under $100. It almost was, though. -Canvases- You can get these at Michaels. I was overwhelmed by all the choices, as far as sizes, but then the choice was clear when I found that the 16×20″ size was just $19.99 for a 5-pack. Yes, seriously! This is amazing!!! The little 8×8’s were like 7.99 EACH. So this was a sick deal. I got 2 five packs. -A staple gun. Have you used one? It’s amazing. The next thing I want to try is a chainsaw. And then a gun. I mean like a regular gun. We went to gun safety class this fall but I had to ix-nay the shooting part because of being pregnant and concerns about inhaling gunpowder and stuff, but I haven’t forgotten I need to make that part of the class up! -Some fabric. I tried to go the budget-friendly route and shopped at Jo-Ann’s first, but everything there was U-G-L-Y, ugly! Maybe I’m a fabric snob, but seriously, that place is good for a piece of material here or the backing for a quilt there, refill blades for your rotary cutter or whatever, but for good fabric, Boulderites, go to Elefriede’s! It will cost you three times as much as Jo-Ann’s but the fabric is GORGEOUS and the ladies there are so nice and helpful, including Elefriede herself, whose accent I happen to love. Cut the fabric so you have at least 1-3 inches extra on each of your borders. 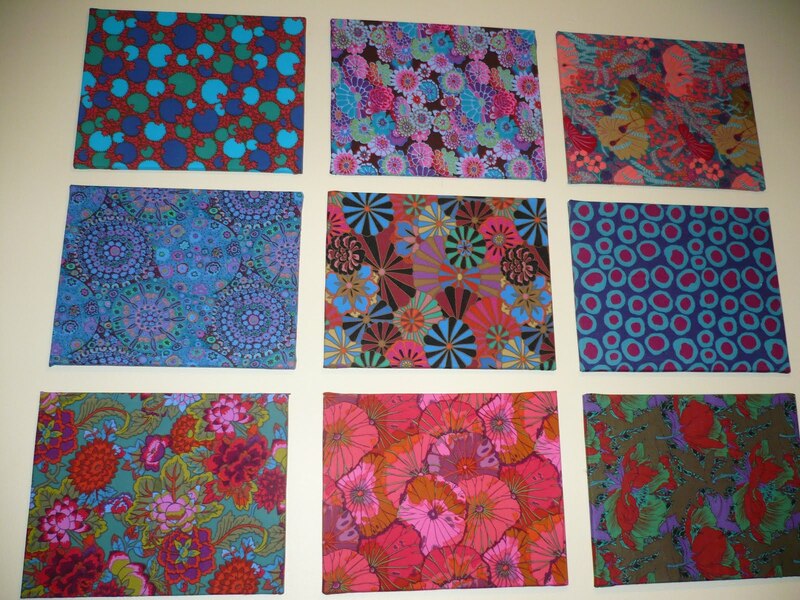 For my 16×20″ canvases, 5/8 yard per fabric was more than enough, and I had plenty of extra. Staple it on one side of the back of the canvas. Stretch it across really tight before you staple the opposite side. If you don’t, you may see creases in the fabric. You may also like to iron your fabric first, but if you do, do the project right away; folding the fabric overnight = creases anyway. After you’ve done your first two sides, fold the other sides of the fabric inward like you would fold gift wrap and continue to staple. 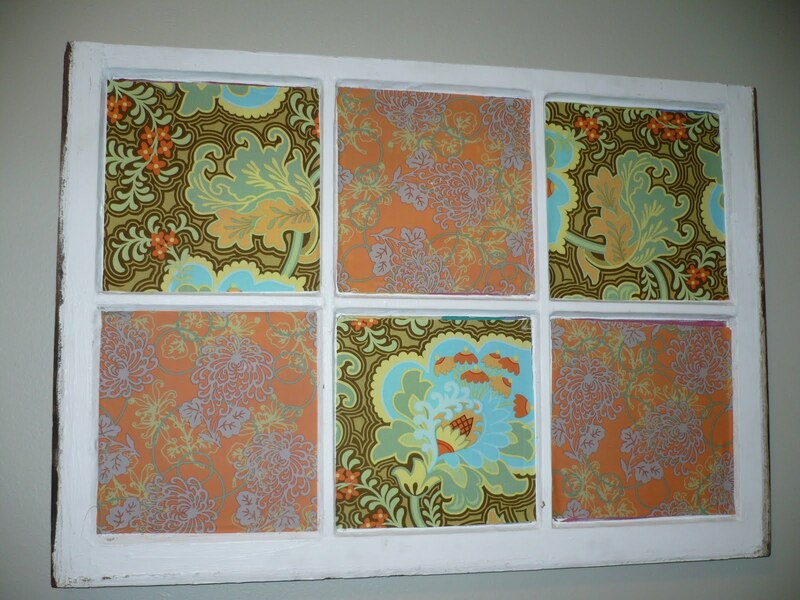 Decide how you want to arrange them – for a big project like this, use your scraps to experiment with placement, THEN hang the canvases. This will save time and sanity. 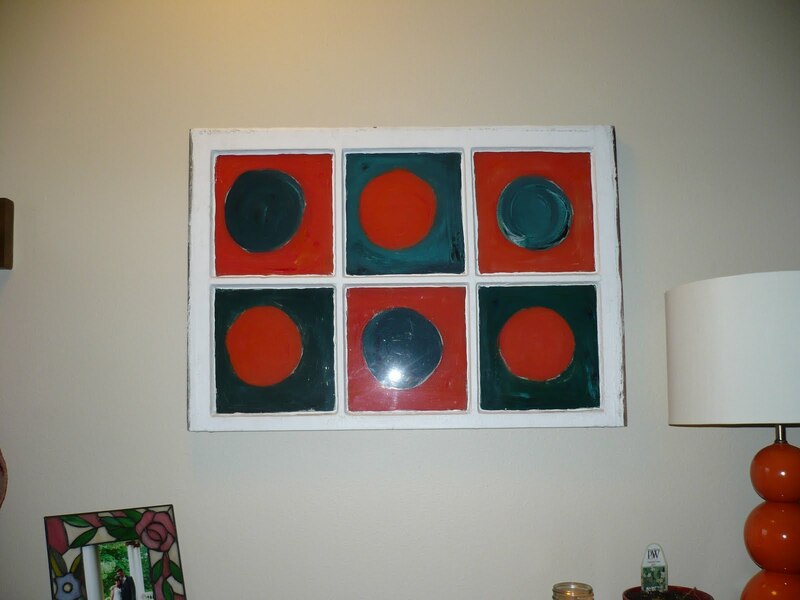 To hang, get out your level, make some straight lines with a pencil, hammer a couple nails about 4-6″ apart per canvas, then hang. The other thing I worked on was this old dresser I got at a yard sale… I wish I had taken a “before” picture, but imagine a chipped, beat up old thing. I got busy sanding and painting, because next to the new crib it looked especially dismal. 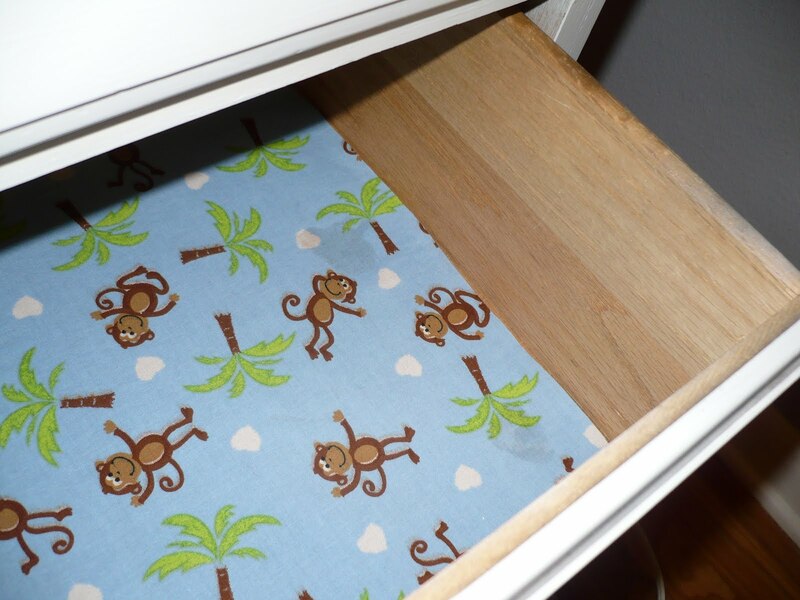 Then I got a little neurotic and decided to line the drawers with fabric… I know, you’ll never see the bottom of the drawers once they are stuffed full of little onesies, burp cloths, and whatever other baby accoutrements will go in there, but the drive to nest overtook reason. This is the dresser, all painted nice. 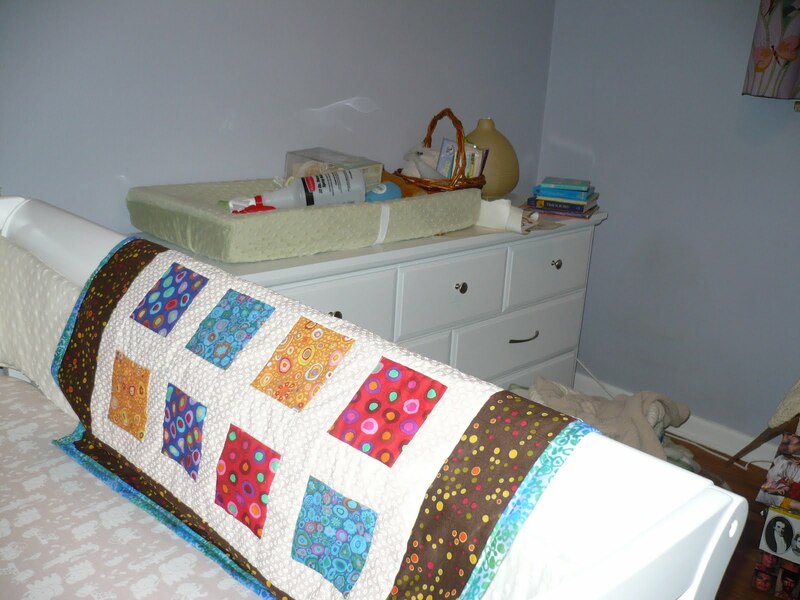 On the crib is a quilt I finished a few months ago. 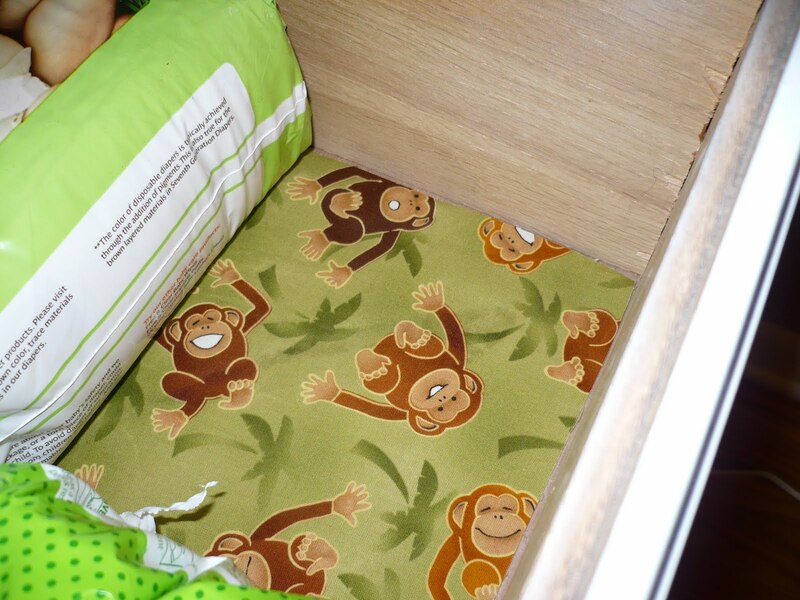 Here are some pics of the drawer liners, which will probably never be seen again. 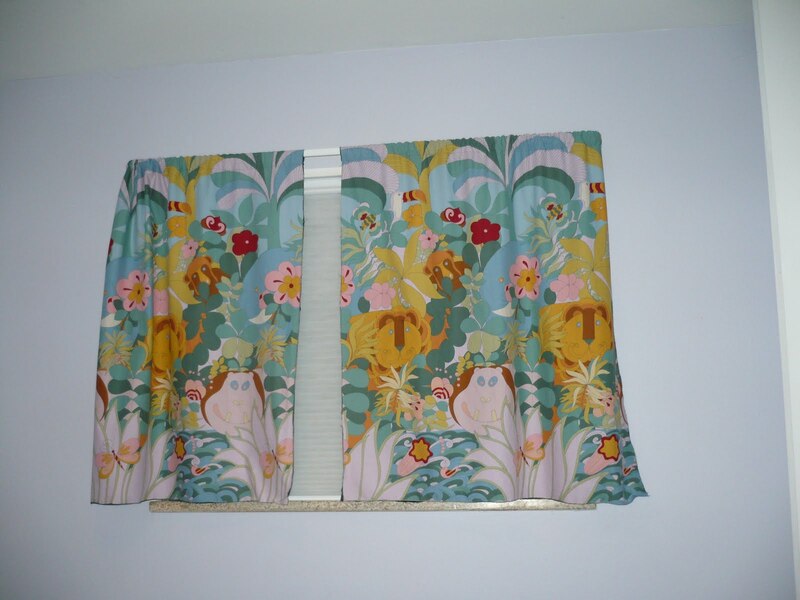 I actually got the cartoon-y looking fabrics (the second and third pics) at Jo-Ann’s. The other thing I worked on was FINALLY hanging some cool art I made/found when I lived in RI and have modified a bit since. This one really is an under $100 DIY project. I highly recommend Providence’s east side for great trash, which is where I got these window frames. (ps, so what if I have a thing for trash?) Then I made them pretty. 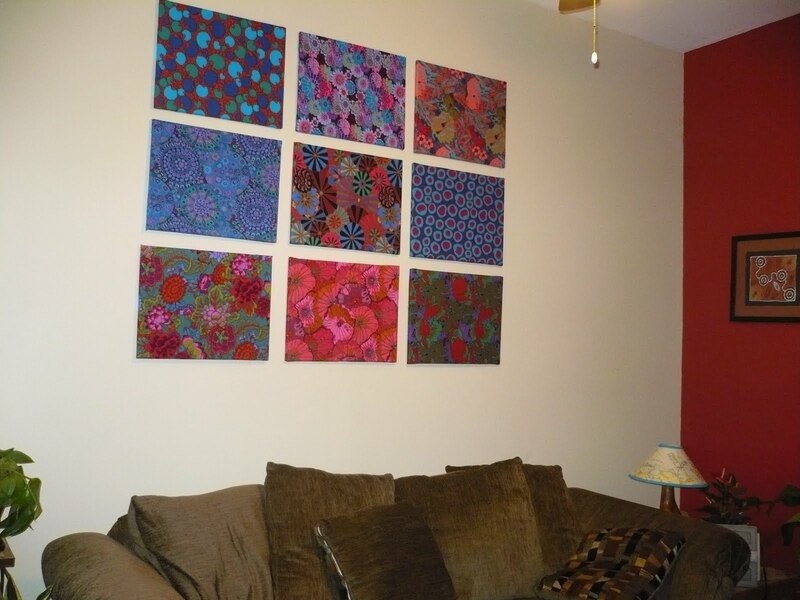 Then a friend and I hung them. Dan noticed the one in the living room and wondered how exactly it was secured onto the wall. I was content to believe it would stay just because I wanted it to and it had been ok so far. He re-hung it. The other one is in my office, where I hung it with a special nail that Dan seems to trust. Either that, or he hasn’t noticed it. Now he will, if he hasn’t… because if I’m still awake when he comes home, I’ll be like “I blogged!” and then I will hang out so my face is no less than two inches from his face and say “When are you going to read my blog?” and “Why haven’t you read my blog yet?? ?” till he reads it. And that’s not because I’m pregnant, that’s just what I’m like if you’re lucky enough to be married to me. Sometimes I get annoyed because he doesn’t comment as liberally as he used to. That said, historically, there has been an inverse relationship between how forcefully I pressure him into reading my blog and how likely he is to comment. And a lot of other stuff I just can’t remember right now. I’m kind of done cooking for in advance because I’m overall just done. Walking around with 25 extra pounds got old a while ago. So did all the other general annoyances that I guess are par for the course. Yesterday, for example, I got stuck in the car! No, I’m not exaggerating. And don’t ask for Dan’s version of it. I’m not exaggerating, you should just believe me. What happened was, we took Dan’s car to go to our friends house, then once we were there, I agreed to be the designated driver so he could enjoy more wine, but to drive his car, I needed to be able to depress the clutch, which means I had to scoot the seat way up, which I normally hate, but now I hate more because the steering wheel was basically smushing the baby (e.g. me). When we finally got home, I couldn’t finesse Dan’s finicky door handle and I was STUCK in the car, freaking out, with a steering wheel in my stomach, while Dan did everything but come around and open the door from the outside, until he finally did. I might have screamed a lot until I was released from the prison that was the driver’s seat of Dan’s car. The neighbors probably think we are getting a divorce now. This is the last week I am scheduled to work. I just want to get through it and then watch stuff on Netflix and also vacuum the basement, wipe the baseboards, and fill out my tax forms (ok don’t want to but have to) and wait for the baby to come. Speaking of Netflix, I just discovered Ruby. Do you know about Ruby? She is the most endearing 400+ lbs. reality tv personality EVER! I love her! I would totally be friends with her if I had the chance. She is on a quest to lose weight and I am totally rooting for her! Even though I saw her on Dr. Phil recently, so I know she is going to lose a lot of weight, that hasn’t ruined the show for me, not at all. I just love watching Ruby conquer her challenge. If Ruby can lose over half her body weight, I am sure I can get through another 3-5 weeks of this little person inhabiting my body. Funny girl, your about to get busier…Good for you to have Danimal to help and be married to!